When Robert and Melissa moved into their family home in the Hertfordshire countryside they were confident that it had the potential to be their dream home. However, a little work was needed to make it perfect, with the kitchen being the main area that required improvement. The old kitchen was long but cramped and dark timber units exacerbated the lack of natural light. Therefore it was imperative to Robert and Melissa that their new kitchen was expansive and filled with natural light. As well as this, Robert and Melissa had previously invested heavily in landscaping their grounds so they were keen to make the most of the beautiful views over the garden and countryside beyond it. As well as the kitchen looking exceptional, Robert and Melissa wanted it to also be of premium quality. 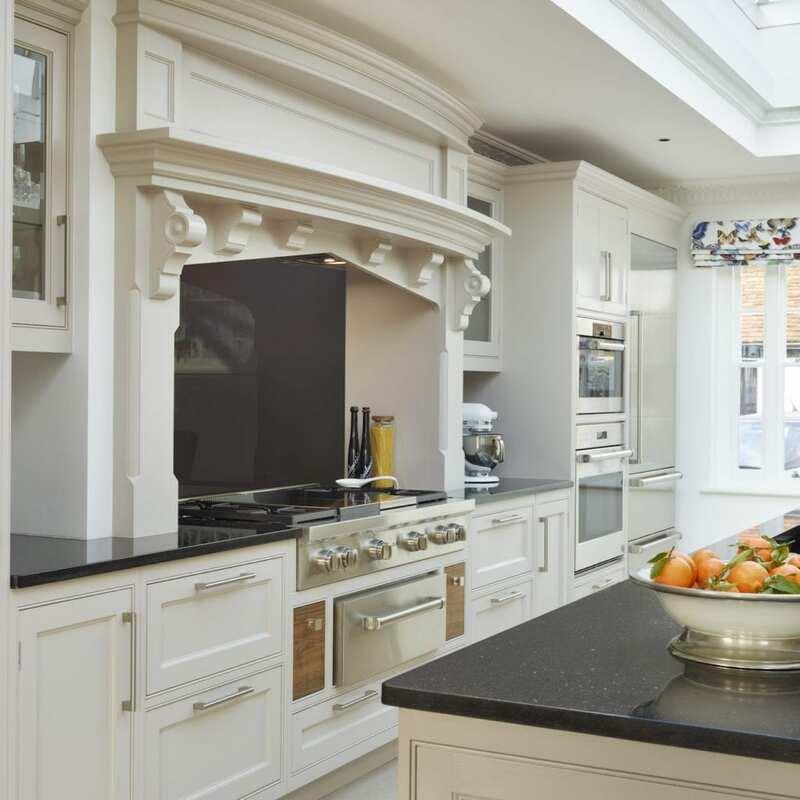 As this property is their dream family home they wanted a kitchen that would retain its beauty and functionality for years to come. Friends of theirs had recently had their kitchen and utility room updated using Davonport furniture designed by one of our Premium Partner Studios, Moneyhill Interiors. They were so impressed by the design and quality that they contacted Celia at Moneyhill Interiors for their own project. 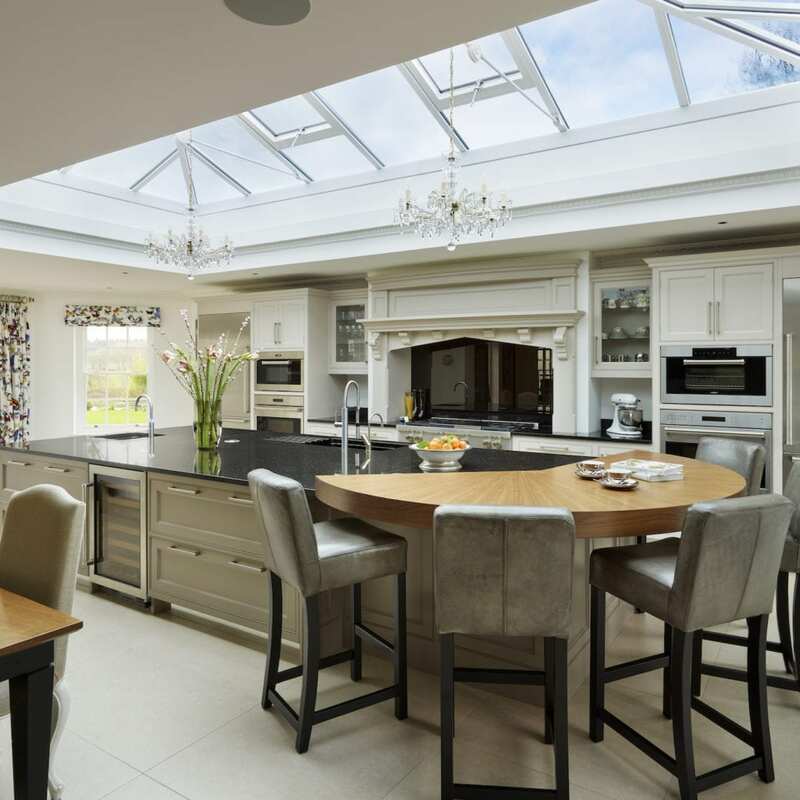 In order to achieve this they commissioned a large extension with a roof lantern – designed to echo a previous extension built to house the family’s swimming pool. 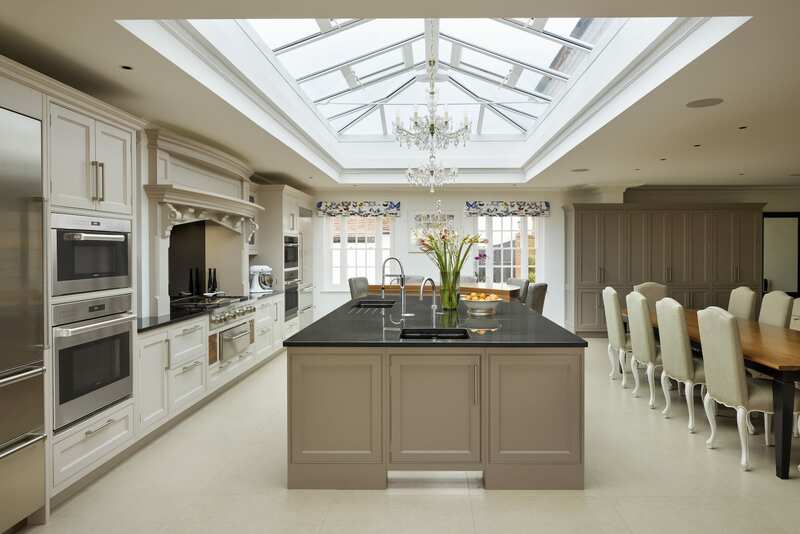 With the kitchen design and extension plans working in unison, the position of the roof lantern was designed to frame the large kitchen island and breakfast bar. As per Robert and Melissa’s desire to make the room bright as well as spacious the kitchen cabinetry was painted in neutral greys, with the kitchen island and pantry-style breakfast cupboard painted in a warm hue (‘Charleston Grey’ by Farrow & Ball) and the cabinetry along the wall in ‘Elephant’s Breath’, also by Farrow & Ball. 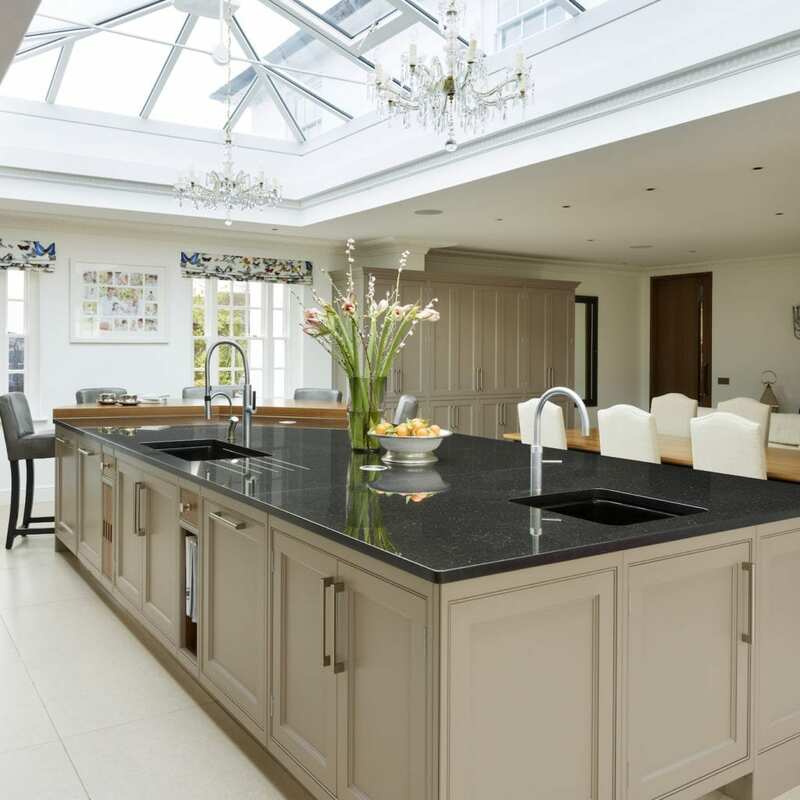 The black galaxy granite completes the understated scheme. 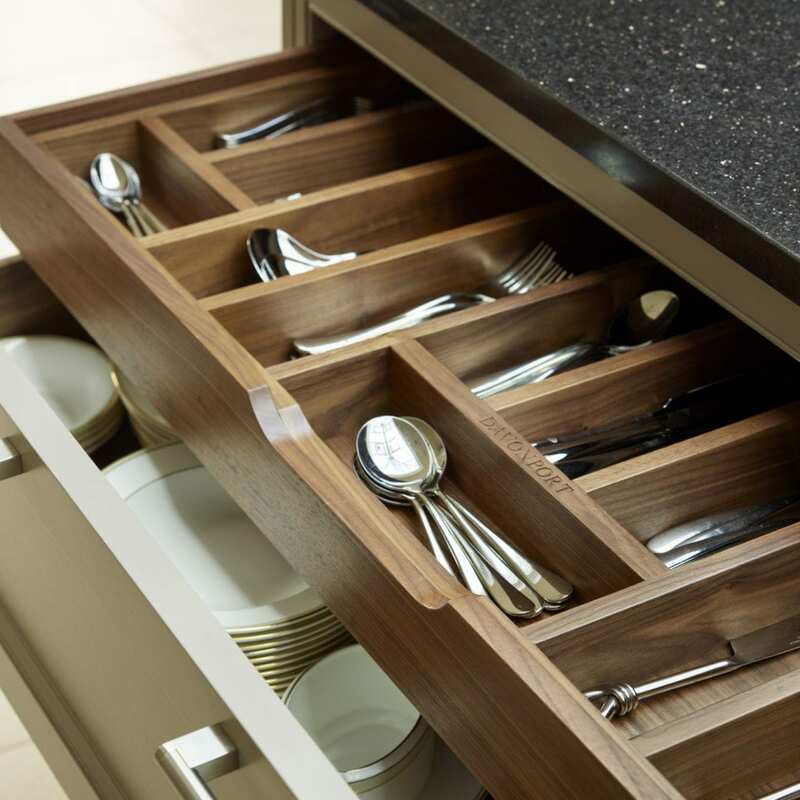 The kitchen cabinetry itself is from our Audley collection – a beautifully classic style that fits the house perfectly. The fact that all Davonport furniture is handmade to order meant that along with premium craftsmanship they could tailor the design to fit their ideal layout and be ergonomic for them as well. 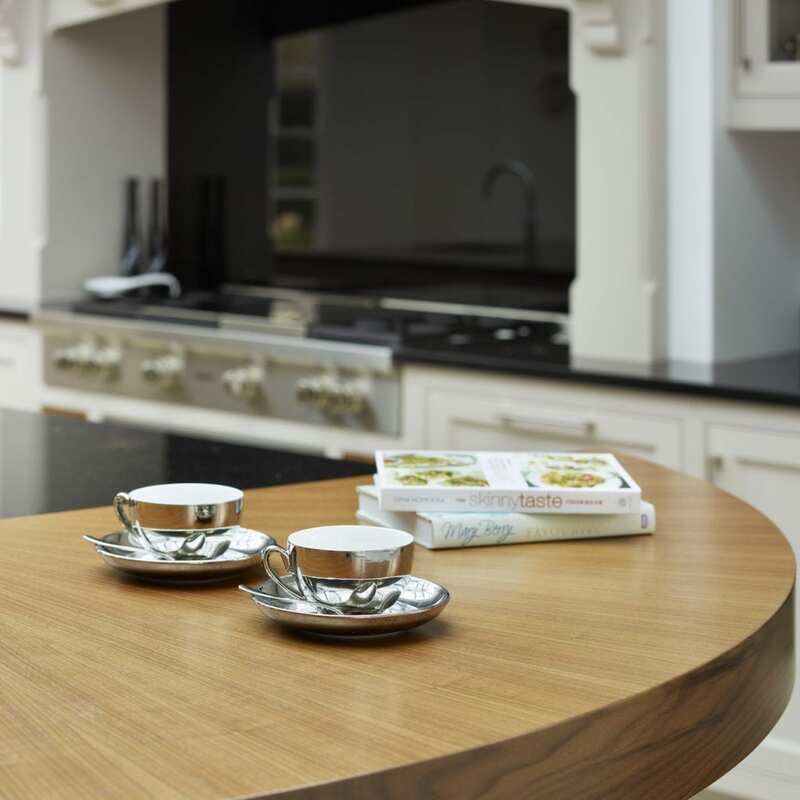 The walnut breakfast bar (with starburst detail) is large enough to seat 4 people with the open plan room designed to flow seamlessly into the dining space. 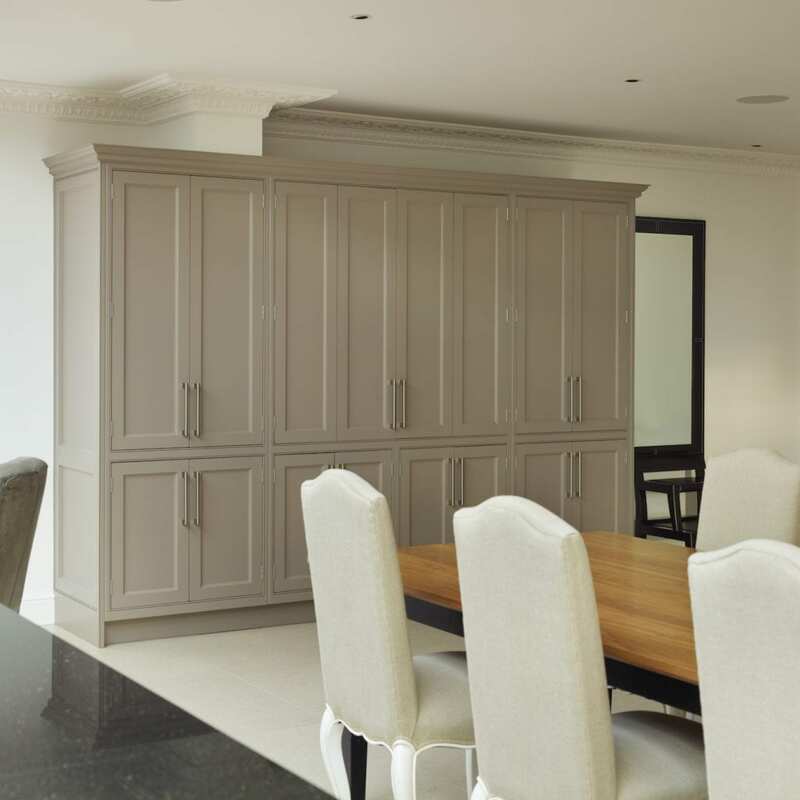 The pantry-style breakfast cupboard by the table is ideal for storing cereals, small appliances and crockery alongside the dining table – perfect for busy breakfasts when the whole family come to stay. 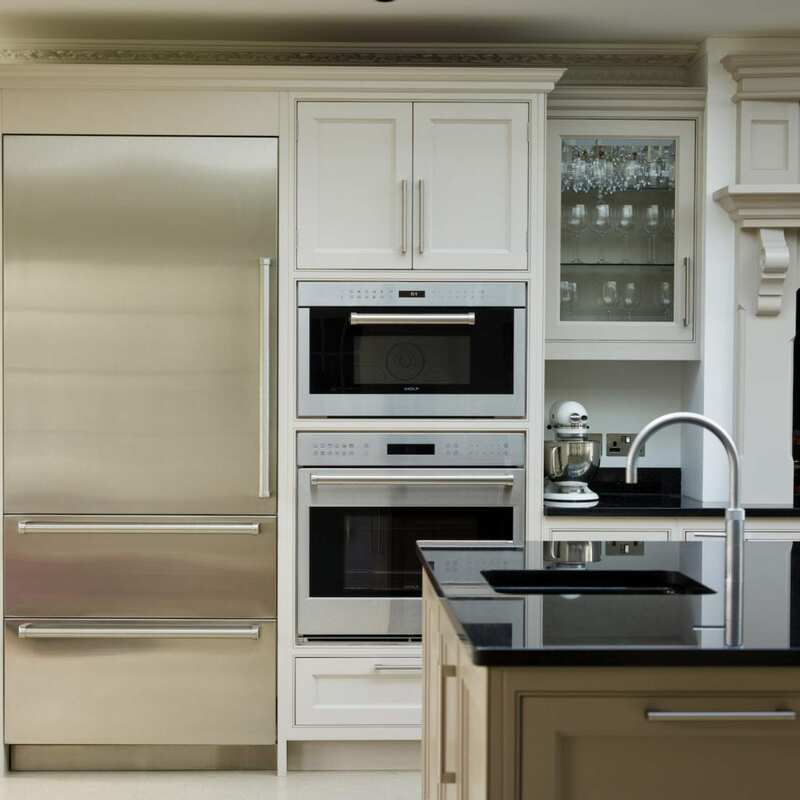 In-keeping with Robert and Melissa’s plans to have everything top spec they chose a variety of Sub-Zero and Wolf appliances to complement their Davonport kitchen; these include a range oven top, 2 fridge/freezers and a wine cooler. 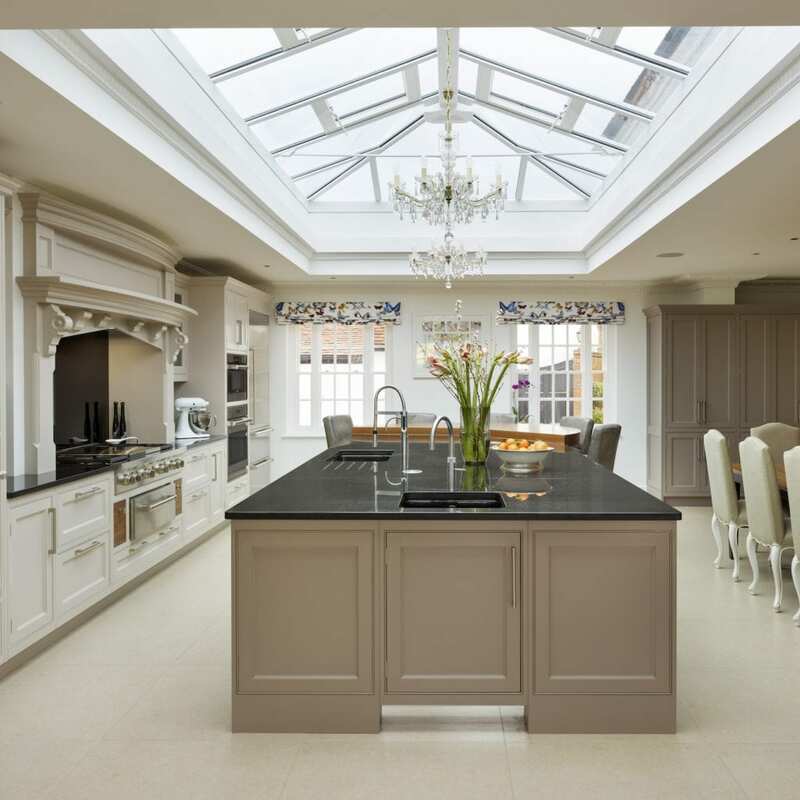 Having undergone significant building work to create their new kitchen Melissa and Robert had high hopes for the space and they were not disappointed. 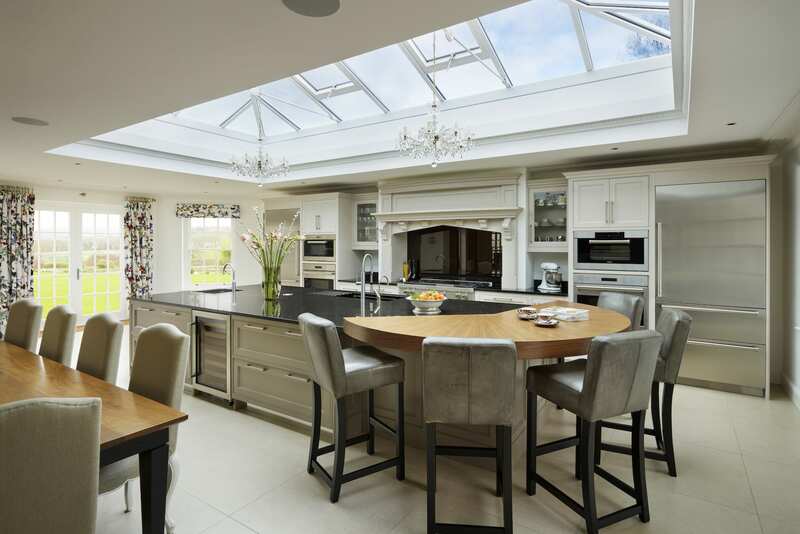 Their kitchen is spacious, bright and fully equipped for when all the family visit, with stunning views across their landscaped gardens. Robert and Melissa now have a magnificent family kitchen with quality and functionality at its core.